Yarwoods hire, sell and service a wide range of Crushing Buckets and excavator attachments. We offer the customer not only a well-built and reliable product but excellent product knowledge, service, maintenance as well as an extensive range of readily available spare parts. 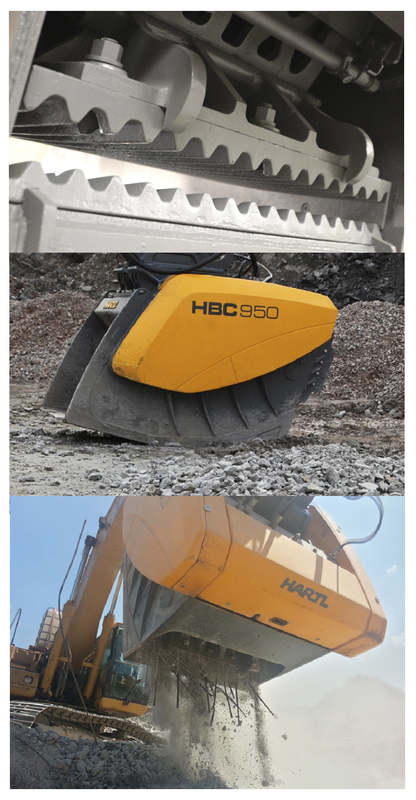 Yarwoods have just invested in a new fleet of HARTL Crusher Buckets, and can offer a crusher bucket to suit most excavators. They are easy to install and work off the excavator’s one-way hydraulic ‘hammer’ lines. The Crusher Buckets are hydraulically driven, and offer many advantages over cumbersome and expensive conventional crushing plant. The-state-of-the-art excavator attachments offer enhanced operator safety, reduced transport costs, quick installation and changeover. Only one crushing machine is required to demolish, crush, recycle and load material. Yarwoods Crushing Buckets are easy to use and cheap to maintain. Noise and dust are kept to a minimum, with an in-built dust suppression unit as standard. Blockages are made a thing of the past thanks to our cutting-edge design and generous throat. The crushing bucket are finding favour with many contractors now, as people start to recognise the costs involved in transport and tipping site waste, all kinds of materials rubble, concrete, rock can all be reduced on site to any size from 20mm to 100mm down. Using a 13/20 ton machine and crusher bucket demolition rubble can be crushed for £5 per ton (figures vary site to site) and used to blind up the site rather than paying off site and tipping charges. Instead of paying to get waste off site to tip, why not fit your digger with a rented crusher bucket from Yarwoods and turn the waste into money? 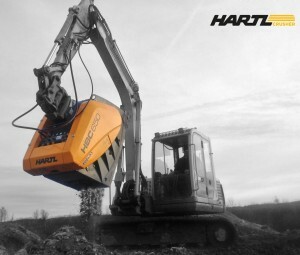 It is Yarwoods policy to use only top brands, so we buy and recommend the HARTL Crusher Bucket. Crusher Buckets are a very diverse excavator attachment that can be used across a wide range of areas from Demolition, Recycling, Quarries and Environmental Reclamation to forestry and Road working. We provide a national repair service from specialist engineers ensuring that our customers are fully supported in the UK.